Domesticated cattle, along with other true cattle and oxen, are members of the Bos genus within the subfamily Bovinae in the family Bovidae. The two individual species of domestic cattle (Bos taurus and Bos indicus) share some characteristics with other Bovidae species; between the two, some characteristics are identical and others are unique. Cattle tend to be stocky with long, rectangular bodies. Beef cattle are more muscular; dairy cattle have a truer rectangular shape. Zebu cattle (Bos indicus) are called humped cattle; each specimen has a hump over its shoulders. The head is small relative to body size; it has a long, straight snout. Cattle have strong necks and prominent dewlaps. Other physical characteristics vary between breed, such as the position of the ears or length of their legs. Weight and height vary greatly between domestic cattle breeds. Some weigh more than 3,000 pounds. Females of the Canadienne dairy breed reach 1,000 to 1,100 pounds. Charolais bulls reach 2,000 to more than 2,500 pounds; cows range from 1,250 to more than 2,000 pounds. At 2 years old, Belgian blue bulls average just over 1,700 pounds and around 53 inches tall, while females of the same age average just over 1,100 pounds. The preferred weight of a mature Dexter bull, a smaller breed, is less than 1,000 pounds; preferred height is 38 to 44 inches at the shoulder; a 3-year-old female Dexter should be 3 feet to 3 1/2 feet at the shoulder and she should weigh less than 750 pounds. Color varies widely among breeds. Devons have a deep reddish-brown color. Holsteins have the characteristic "cow print" of black and white. Dutch Belteds are black with a distinct white belt around the belly. Other breeds have color variations from one specimen to another. Brahman, for example, range from light grey to almost black. Some specimens are reddish. Cattle are prey species. Their eyes are located on the sides of their heads, allowing them to capture movement around them. But they take longer to focus on specific objects. Their excellent peripheral vision creates a panorama effect on their sides. 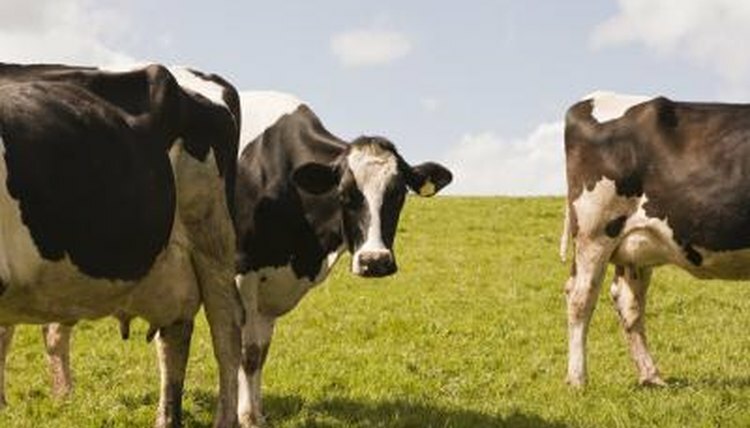 Their hearing tends to be sensitive to high-pitched noises, dairy breeds moreso than beef breeds. Herbivores, cattle feed primarily on grasses and stems. To pull up grass or a plant, a bovine twists its tongue around the plant and cuts it off with its bottom teeth. In place of upper incisors, A bovine has "dental pads" ideal for grinding coarse grasses and other plant materials. The bovine is a ruminant, possessing a four-chambered stomach. The four chambers are the rumen, reticulum, omasum and abomasum. Food first goes through the rumen and reticulum, where bacteria help break it down into cud, a substance cattle regurgitate and chew again. Then the food goes through the omasum and into the abomasum. This digestive process can take 70 to 100 hours.